These Chippewa Men's 55160 Waterproof 6 Inch Bay Apache Leather Boots make you feel like you can do anything at anytime, regardless of the weather. You can wear them outside, even when it rains or when you’re working in standing water. This is because of the seam ... (see full details) (see specifications) #CHP55160. These Chippewa Men's 55160 Waterproof 6 Inch Bay Apache Leather Boots make you feel like you can do anything at anytime, regardless of the weather. You can wear them outside, even when it rains or when you’re working in standing water. This is because of the seam-seal construction that keeps water out. If you wear the Chippewa boots on a warm day, the breathable and quick-drying Dri-Lex aerospacer lining wicks perspiration away from your feet to keep them comfortable. The durable uppers on these men's boots are constructed from waterproof bay apache leather. You don’t have to walk around for weeks or months with that “new” boot look because apache leather has that broken in look - even when it's brand new. This strong leather is abrasion-resistant, and if you do get a scuff, most of the time it’ll rub right out of the waterproof boots. The Flexwelt footbeds provide you with arch support for stability, and the waterproof/seam sealed construction keeps these brown boots flexible. Your feet will rest easy, knowing that fiberglass shanks are in place to provide extra reinforcement. The rugged soles are made from black rubber, and they're slip- and oil-resistant to prevent corrosion from exposure to chemicals and oils. Tie up this Chippewa footwear with their heavy duty nylon laces, and you'll be good to go. 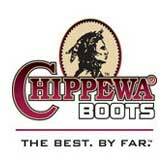 Order your Chippewa Men's 55160 Brown Waterproof 6 Inch Leather Boots today from Working Person's Store. You'll be able to handle the changing weather conditions with ease in this men's footwear, so get yours soon! Chippewa Boots: Men's Waterproof 55160 Brown Leather 6 Inch Work Boots is being added to your cart.